Motown has come out with another annual release of outtakes as a way to preserve European copyright on the materials. 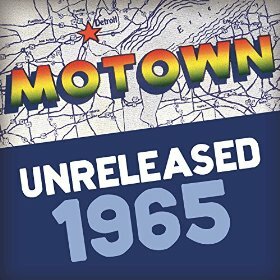 Featuring unissued work by Stevie Wonder, Smokey Robinson, the Four Tops and more, Motown Unreleased 1965 is available via download from Amazon and other providers. In Europe, music releases become public domain after 50 years if they are not issued or reissued. That means anyone, not the original copyright holders, can issue and profit from them. Motown has issued an "unreleased" compilation each year since 1963 in order to retain its copyrights on unissued recordings. The Beach Boys have done the same via CDs or downloads. And Bob Dylan has taken the route of issuing outtakes and live recordings via extremely limited CD and vinyl edition. This year, he's issued 10 hours worth of 1965 live recordings as a special, limited add-on to his The Cutting Edge 1965-1966: The Bootleg Series Vol. 12 set. The Beatles even got into the act a couple years back with a digital release of 1963 material, but skipped last year. No word, yet, if anything is planned this year for their 1965 recordings, which would include loads of studio outtakes, live concert and broadcast performances. In the meantime, here's what's featured on Motown: Unreleased 1965.